Jarrin Root is a rare plant unique to the island of Stros M'Kai. 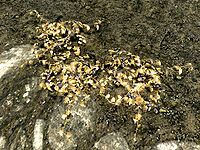 It is extremely toxic, and eating it will result in instant death. For this reason, it is highly prized for use as a poison. Jazbay is a sprawling, low growing plant most commonly found in the volcanic tundra of Eastmarch. The plant produces grapes known for their flavor and acidity. The grapes were once reserved only for emperors due to their exceptional flavor, and picking them was considered treason. Growers in Skyrim were successful in improving the survivability of the plant, but at the cost of the taste. It is no longer illegal to pick the grapes, although harvesting them in large amounts is still frowned upon by the law. 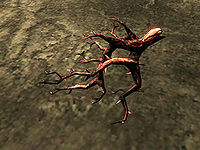 The acidity of the grapes makes them a perfect fertiliser for nirnroot, and they are highly useful to alchemists. 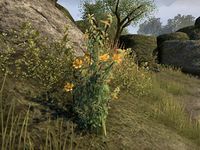 This common plant, is known for its' distinct flowers and sweet scent and can be found growing in Murkmire. It can be used as an ingredient in artificial Toad Musk. 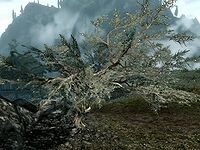 Juniper are stocky silvery trees, common throughout The Reach region in Skyrim, which produce a berry often used to enhance the flavor of mead. 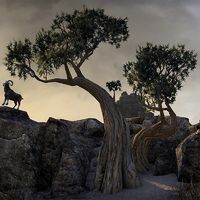 Another variety can be found in the Alik'r Desert, where its' leaves are used in medicines and certain Ash'abah rituals. Jute is a fibrous plant commonly used for making simple clothing. This page was last modified on 22 November 2018, at 05:36.